I really like “proper” Italian-style lasagne with layers of lasagne sheets, homemade ragù Bolognese and bechamel, but it takes quite a while to make. This lasagne dish is quite tasty and creamy without any bechamel, thanks to the gorgonzola cheese, and it’s way quicker to cook as the sauce needs to be cooked for only 25 minutes, while a proper ragù should be cooked for several hours. Prepare the sauce. Fry on medium-low heat the chopped onion with a couple of tablespoons of olive oil. In the meantime, cut the chorizo lengthwise and then cut it into ⅓cm slices (as thick as a £1 coin). Add the chorizo to the pan and fry for a few minutes. Add the canned crushed tomatoes, half a can of water, some salt and some black pepper to the pan. Bring back to a boil on medium heat and cook uncovered for 25 minutes. Add the gorgonzola to the sauce and let it melt. Stir to mix the melted gorgonzola. Assemble the lasagne. Spread a couple of spoons of the sauce on the bottom of an oven safe rectangular dish (I use a 35x23cm pyrex dish). Cover with a layer of lasagne sheets. The sheets should cover completely the surface without overlapping; you can simply break them with your hands to get the needed size to fill all the gaps. Spread one third of the tomato sauce on the lasagne. Cover with one third of the grated mozzarella. Repeat with more lasagne, sauce and cheese. In total you should have enough ingredients for three layers. Spread the grated Parmigiano cheese on top of the lasagne. You can now bake the lasagne or keep it in the fridge until needed; it will last for a couple of days. You can also freeze the lasagne until needed. In this case defrost it completely before baking. Bake the lasagne in a preheated oven at 180 °C for 30 minutes. 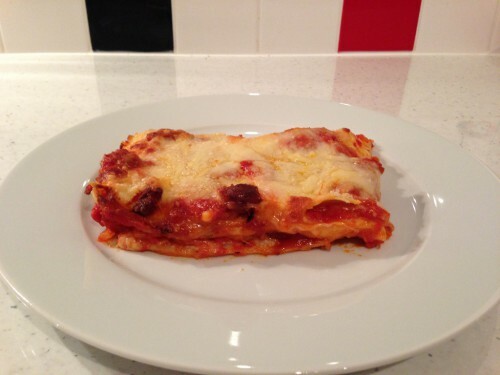 If you have leftover lasagne you can just reheat it in a microwave. This entry was posted in first courses, main courses and tagged cheddar, chorizo, gorgonzola, italian, lasagne, mozzarella, parmigiano by Marco Barisione. Bookmark the permalink.